A flyover of Belize's thick jungles has revolutionized archaeology worldwide and vividly illustrated the complex urban centers developed by one of the most-studied ancient civilizations -- the Maya. Aboard a Cessna 337, LiDAR (Light Detection and Ranging) equipment bounced laser beams to sensors on the ground, penetrating the thick tree canopy and producing images of the ancient settlement and environmental modifications made by the inhabitants of the Maya city of Caracol within 200 square kilometers (77 square miles). UCF anthropology professors Arlen and Diane Chase have directed archaeological excavations at Caracol for more than 25 years. The hard work of machete-wielding research scientists and students has resulted in the mapping of some 23 square kilometers (9 square miles) of ancient settlement. The NASA technology aboard the Cessna saw beyond the rainforest and detected thousands of new structures, 11 new causeways, tens of thousands of agricultural terraces and many hidden caves – results beyond anyone's imagination. The data also confirm the size of the city (spread over 177 square kilometers or 68 square miles) and corroborate the Chases' previous estimates for the size of the population (at least 115,000 people in A.D. 650). Until now, Maya archeologists have been limited in exploring large sites and understanding the full nature of ancient Maya landscape modifications because most of those features are hidden within heavily forested and hilly terrain and are difficult to record. LiDAR effectively removes these obstacles. "It's very exciting," said Arlen Chase. "The images not only reveal topography and built features, but also demonstrate the integration of residential groups, monumental architecture, roadways and agricultural terraces, vividly illustrating a complete communication, transportation and subsistence system." UCF Biology Professor John Weishampel designed the unique LiDAR approach. He has been using lasers to study forests and other vegetation for years, but this was the first time this specific technology fully recorded an archeological ruin under a tropical rainforest. 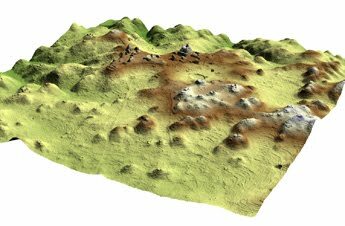 "Further applications of airborne LiDAR undoubtedly will vastly improve our understanding of ancient Maya settlement patterns and landscape use, as well as effectively render obsolete traditional methods of surveying," Chase said. The images taken at the end of the dry season in Belize last April took about 24 hours of flight time to capture and then three weeks to analyze by remote sensing experts from the University of Florida. Now Caracol's entire landscape can be viewed in 3-D, and that already offers new clues that promise to expand current understanding of how the Maya were able to build such a huge empire and what may have caused its destruction. "The ancient Maya designed and maintained sustainable cities long before 'building green' became a modern term," said Diane Chase, who has worked as co-director of the Caracol Archaeological Project beside her husband for the past 25 years. Her conclusion is based on the extensive agricultural terracing LiDAR revealed. In addition to the UCF researchers, partners include Jason Drake with the U.S. Forest Service in Tallahassee and an adjunct professor at UCF; Ramesh Shrestha, K. Slatton and William Carter of the National Center for Airborne Laser Mapping; and Jaime Awe, director of the Institute of Archaeology in Belize. Much more powerful information is anticipated from the data collected. UCF's Weishampel said rainforests play an important role in understanding and managing global warming today. The team's results also give him a snapshot of forest vegetation in that part of the world and how it was influenced by land-use practices 1,000 years ago. This may help scientists understand past human-environment interactions and changes that should be made today.